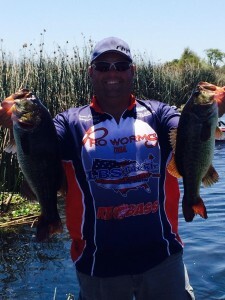 I had pre-fished for this tournament for five days in two weeks, finding that there was a really nice Frog and Crankbait bite the first week and a Frog and Buzzbait bite the second week. The common denominator was the Frog. So, on tournament day I was prepared with two Frogs, a Buzzbait, a Punch set up and a Rover. Saturday rolled around and we ran to our first spot, now one of the big keyes to our bite was the current. We needed the Deltas current to be moving to really activate our fish, our first stop was perfect the tide was going out and it positioned our fish right were we wanted them. Thirty minutes into the day we had our first five fish limit in the boat. Frogs and Buzzbaits did the trick fishing them around sparse tullies near deep water. This pattern held up for us all day and we culled up several times. If it had not been for missing several big bites we would have weighed in the top ten first day, instead we ended day one in 33rd place with 12.35 pounds. The second day of the Delta Championship. Sunday started with another run to our area on the delta but the The Frog Bite and the Buzzbait bite were gone it took us and hour to put the first fish in the boat and it came on a River2Sea Rover. the rest of the day was spent in wonder of where our bite had gone. We tried all the same areas with the same baits to no avail. Around ten thirty my partner put another solid keeper in the boat, once again on a Rover. We came around one point that had a lot of current on it and caught nothing then noticed the current slamming the tullie lined rock bank in front of us. It just looked like a great bank to throw a Senko. Second cast three pounder in the boat, then it was on. I tied on the Senko and loaded the boat with two more fish both in the five pound range. This was all at 11:15 our weigh-in time was 12:00 no time to waist. Fished our way back to Sugar Barge and weighed in our 17.95 pound bag. This placed us in 12th overall with a two day total of 30.80 pounds for the Delta Championship. The key to catching fish for us never changed all weekend current on sparse tullies by deep water. The baits changed to slower top water presentations and sub surface baits but the structure stayed the same. Copyright © Big Ed Fishing and James Everhart. All Rights Reserved.